First impressions are very important. And on a BBQ Sauce bottle, the packaging says a lot about your product. Labels are your most important sales tool when you can’t be there to sell the sauce yourself and talk about what’s inside the sauce. 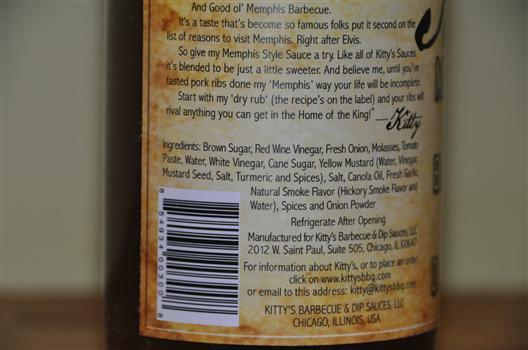 Kitty’s Memphis Style Barbecue and Dip Sauce starts out on the right foot with a clean appearance – a unique bottle, a vintage-looking label, and lots of bare bottle revealing the tasty sauce inside the bottle. Mmmm. Maybe I’d like the top to be a little bit wider, but that’s really nitpicking. Ingredients are very high quality – no expenses was spared in providing a quality sauce here. No evidence of high fructose corn syrup, preservatives, or strangely named chemicals. It wouldn’t hurt to call out the healthy angle a bit more… lots of people are looking for this in sauces. The flavor I get is a 3 way blend of 1) classic tomato-based BBQ Sauce, 2) onions, and 3) liquid smoke. If you don’t like onions or smokey BBQ sauce, then this isn’t the sauce for you. Color and Consistency is good, could be a little thicker, but lots of specks and natural appearance. Highlight the healthy stuff. 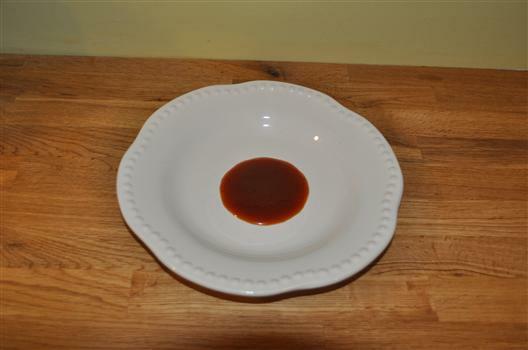 A lot of people online are looking for specialty sauces that they might not be able to find in a store near them such as Gluten-free sauces, low-carb sauces, and HFCS-free sauces. It appears that this is a candidate to claim gluten-free or “no HFCS!” It never hurts to call out this stuff, even if in a very subtle way. Some folks (like Larry Gaian over here) love to have high fructose corn syrup in their sauces so don’t alienate the diehards 🙂 but let the dieters and health-conscious know you are thinking about them. The rub recipe on the side of the bottle is great. Most often people will stick a recipe that refers to another kind of related spice rub that someone would have to buy. Instead, the bottle points to a simple rub recipe that anyone can make with equal parts salt, sugar, and paprika – and a little bit of black pepper… The step by step directions for preparing ribs is also a great touch. Very thorough review! Well done!